If you have a smaller group and would like to go out for only a couple of hours we would like to introduce you to the two new boats in our fleet. ﻿"BARBI T" is the newest addition to the Toronto Waterfront. She is a magnificent 45 passenger triple pontoon boat, with a 30' x 12' frame. 7 bulkheads per pontoon create a sturdy design as well as focusing on the safety of the passengers. The sturdy aluminum roof provides excellent protection from the elements. Weather skirting also adds to accomodate any weather condition and offers protection. 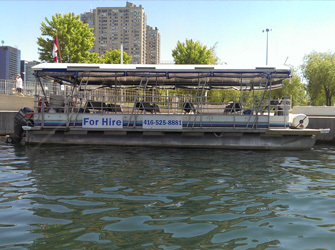 The "BARBI T" is a great platform for groups who want a convienient, economical and pleasurable cruise in the harbour with the option of a meal on the Toronto Islands. Guests will be offered to custom order meals from local restaurants and we will have them brought on board, hot and ready to enjoy. Clients will be encouraged to bring a frisbee, some ball gloves, or badminton rackets and enjoy a short, active stay on the Island. Swimming from the boat will also be permitted. Pets are very welcome! Barbecueing can be done on the island. Affordable intoductory rates starting at $390 for the first hour and $150 for the second. "CUPPA T" is our new 12 passenger boat that is available anytime for anything! Enjoy a short tour of the harbour or hire your own boat with a Captain for the day. Rates start at $200 for the first hour and $150 for the second. Bring your own food and beverages. Includes, Captain, boat and fuel. Book a shorter Toronto cruise for your group today.